The financial market is a marketplace where investors deal in financial instruments. It provides a vehicle for allocation of savings to investment. It can be grouped as money market and capital market. Both the markets are very important in the financial sector. In the money market, extremely liquid financial instruments are traded, i.e. monetary instruments of short-term nature are dealt. On the contrary, the capital market is for long term securities. It is a market for those securities which have direct or indirect claims to capital. Capital Market plays a crucial role in the development of the economy because it provides channels for mobilization of funds. On the other hand, money market possesses a range of operational features. 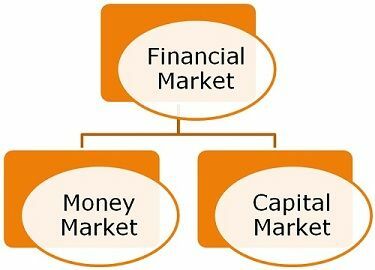 The article presented to you explains the difference between money market and capital market in tabular form. Meaning A segment of the financial market where lending and borrowing of short term securities are done. A section of financial market where long term securities are issued and traded. Financial instruments Treasury Bills, Commercial Papers, Certificate of Deposit, Trade Credit etc. Shares, Debentures, Bonds, Retained Earnings, Asset Securitization, Euro Issues etc. Institutions Central bank, Commercial bank, non-financial institutions, bill brokers, acceptance houses, and so on. Commercial banks, Stock exchange, non-banking institutions like insurance companies etc. Purpose To fulfill short term credit needs of the business. To fulfill long term credit needs of the business. Merit Increases liquidity of funds in the economy. Mobilization of Savings in the economy. An unorganised arena of banks, financial institutions, bill brokers, money dealers, etc. wherein trading on short-term financial instruments is being concluded is known as Money Market. These markets are also known by the name wholesale market. Trade Credit, Commercial Paper, Certificate of Deposit, Treasury Bills are some examples of the short-term debt instruments. They are highly liquid (cash equivalents) in nature, and that is why their redemption period is limited to one year. They provide a low return on investment, but they are quite safe trading instruments. Money Market is an unsystematic market, and so the trading is done off the exchange, i.e. Over The Counter (OTC) between two parties by using phones, email, fax, online, etc. It plays a major role in the circulation of short-term funds in the economy. It helps the industries to fulfil their working capital requirement. A type of financial market where the government or company securities are created and traded for the purpose of raising long-term finance to meet the capital requirement is known as Capital Market. The securities which are traded include stocks, bonds, debentures, euro issues, etc. whose maturity period is not limited up to one year or sometimes the securities are irredeemable (no maturity). The market plays a revolutionary role in circulating the capital in the economy between the suppliers of money and the users. The Capital Market works under full control of Securities and Exchange Board to protect the interest of the investors. The Capital Market includes both dealer market and auction market. It is broadly divided into two major categories: Primary Market and Secondary Market. Primary Market: A market where fresh securities are offered to the public for subscription is known as Primary Market. Secondary Market: A market where already issued securities are traded among investors is known as Secondary Market. The place where short-term marketable securities are traded is known as Money Market. Unlike Capital Market, where long-term securities are created and traded is known as Capital Market. Capital Market is well organised which Money Market lacks. The instruments traded in money market carry low risk, hence, they are safer investments, but capital market instruments carry high risk. The liquidity is high in the money market, but in the case of the capital market, liquidity is comparatively less. The major institutions that work in money market are the central bank, commercial bank, non-financial institutions and acceptance houses. On the contrary, the major institutions which operate in the capital market are a stock exchange, commercial bank, non-banking institutions etc. Money market fulfils short-term credit requirements of the companies such as providing working capital to them. As against this, the capital market tends to fulfil long-term credit requirements of the companies, like providing fixed capital to purchase land, building or machinery. Capital Market Instruments give higher returns as compared to money market instruments. Redemption of Money Market instruments is done within a year, but Capital Market instruments have a life of more than a year as well as some of them are perpetual in nature. The main aim of the financial market is to channelize the money between parties in which Money Market and Capital Market help by taking surplus money from the lenders and giving them to the borrower who needs it. Millions of transactions take place around the world on a daily basis. Both of them work for the betterment of the global economy. They fulfil the long term and short term capital requirements of the individual, firms, corporate and government. They provide good returns which encourage investments. Good summary. I like the site. Excellent one. A very informative & brief description of Financial Market. Thanks to all the readers, for appreciatng the articles, it means a lot to us, keep reading. Brilliantly explained, keep it up. well explained, hope no hidden details. Thanks for the in-depth analysis. I’ll appreciate if I get a copy of the above material and all other related materials for a dummy like me. Thank you. The detail and analytic academic resource that is assisting for better understanding of the desired topic in different perspective of the learning. Good and easy to understand summary .I like it.